Looking for a super speedy weeknight meal that feels like you put in way more time and effort? Look no more. 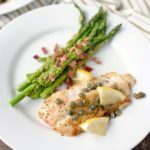 That is exactly what this pan fried cod with pesto bacon asparagus will get you, especially if you make the pesto in advance! Since today is daylight savings time day (at least it is here in the Pacific Northwest and hopefully you remembered to set your clock ahead one hour), I figured you’d need to get that time back this coming week, and this is a perfect time-saving weeknight meal to put on your planner this week. This is a recipe for a complete meal, prepared and on the table in only about 15-20 minutes. Get ready to get in and out of the kitchen so you can enjoy a light, yet satisfying meal with your people. This one is going to make you look like a pro in the kitchen. For the asparagus, you just cook up your bacon bits till they’re almost all the way done (they’ll finish crisping up in the oven) smother your asparagus with our lemon artichoke pesto, sprinkle your bacon bits right on top, and pop your pan in the oven. The bits of bacon come out of the oven a little crispy and salty, and coupled with the vibrant pesto, you’ve got a side dish flavorful enough to be a main. The best part to all of this is that the cod will only take about 6 minutes to pan fry on the stove with avocado oil, butter, or ghee. What?! Yep, it cooks up that fast to perfection! Try to get your cod in matching sizes so they cook evenly and in the same amount of time. Alright, get into the kitchen, put it all together, and enjoy this easy weeknight meal. 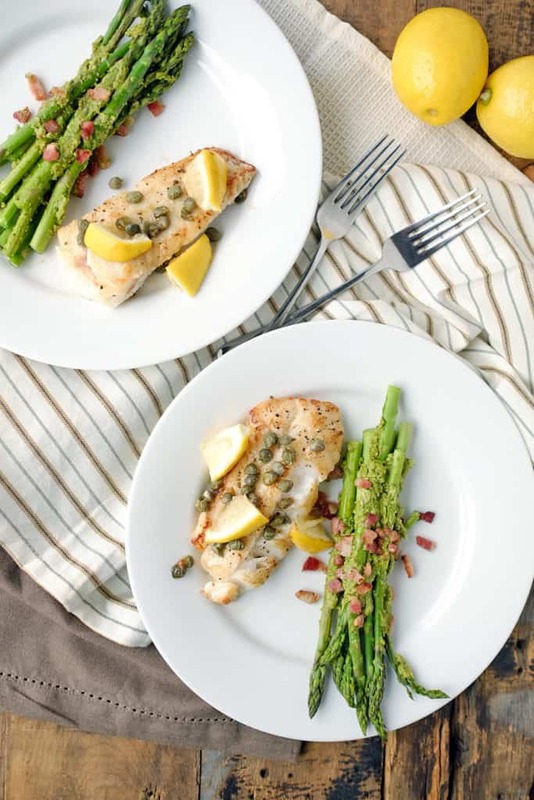 Try out this recipe for pan fried cod with pesto bacon asparagus, and let us know what you think by leaving a comment below. Also, take a picture and tag us on Instagram @realsimplegood so we can check it out! Start by making your lemon artichoke pesto sauce. If you have time make it in advance so all you have to do is pull it out of the fridge when you go to make dinner. Slice your bacon into bits and cook on the stove over medium heat. Cook until the bacon is almost crispy. Then, place it on a paper towel lined plate while you get the asparagus ready for the oven. Next, heat a medium pan with your grassfed butter, ghee or avocado oil. Just let the pan heat up. While your pan is heating up, place your asparagus spears in a line on your baking sheet. Smother with your pesto sauce, and then sprinkle your bacon bits generously over the asparagus on your baking sheet. 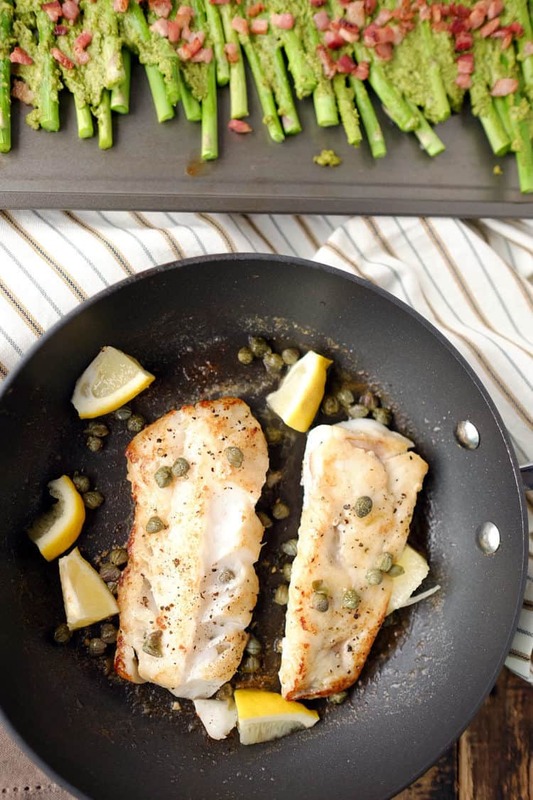 Place your baking sheet in the oven and broil while you pan fry your cod. Pat your cod dry with a paper towel. Then season with salt and pepper. Place your cod in your heated pan on the stove with the seasoned side up. It should sizzle as it hits the pan. Cook for 2-3 minutes. Flip your cod over and season with salt and pepper. Cook for another 2-3 minutes. While it is cooking squeeze fresh lemon juice on top and add a couple tablespoons of capers to the pan if you like them. Remove from the stove, remove your asparagus from the oven, and plate your dinner! Eat up! 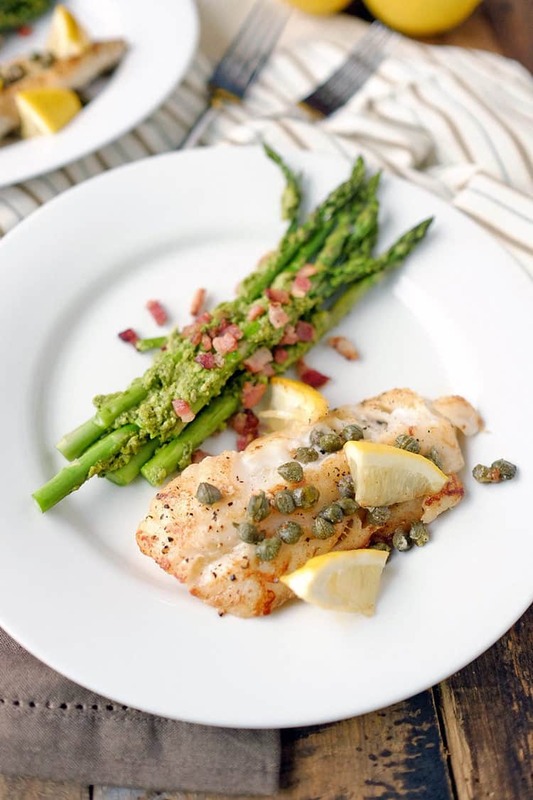 This pan fried cod with pesto bacon asparagus is so easy and magically delicious! Beautiful! Pinned to my W30 board! This looks so good! This would be a huge hit for dinner in my home. Pinning. I never buy cod, not sure why, but this is a reason to pick some up next time I’m at the store. Yeah, give it a try! We go back and forth between cod and halibut, and cod is definitely more economical! Love this simple cod recipe! Bacon and asparagus make it even more divine! Love any recipe with capers and pesto! Yeah, pesto gets me every time too! I didn’t really think I liked capers until more recently, but now I think they’re a great addition to so many dishes! Thanks Elaina! Once I had made cod at home a few times, I wondered why I never really did it before, and now it’s a somewhat regular occurrence. I’ve also learned I prefer to make it on the stove versus in the oven! Hope you’ll enjoy it, and maybe we’ll do a battered and fried version soon too! This looks amazing! We will be having asparagus coming up soon in our asparagus bed and I just so happen to have some cod in my freezer. Delicious combo and super simple to make! With a family of five I need delicious recipes to keep them from getting bored with the same ole thing. Perfection! It’s like it was meant to be! Hope you and your family love this simple, yet vibrant meal! Enjoy! So easy and very tasty! Thank you!